Click here for the original Forbes page text. In its simplest form a theremin works by mixing two high-frequency oscillators, one fixed and one tuned by the capacitance of the player's body, and extracting the audio-frequency difference between the two signals. 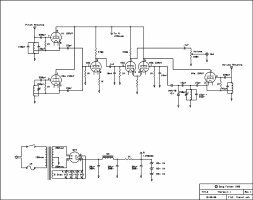 Typically a second capacitively tuned oscillator is used to control the amplitude of the audio output. "...Take a plastic film can--this will become your coil form. Use number 30 enamelled magnet wire (it winds very easily) and wind, in a single layer with the turns of wire laying neatly side by side, 66 turns of wire. Pull out some wire from the end of the winding (about five or six inches is fine), then with this "center tap" pulled out, continue winding an additional 33 turns of wire. Secure the ends of the coil, and the center taps, with silicon caulk. "The smaller coil (between the center tap and the end of the 33 turns) will substitute for the coil in Doug's oscillator between the cathode and ground, while the larger coil (the 66 turns between the beginning of the coil and the center tap) will go between the grid and the cathode. The rest of the design remains as-is, although the values of the variable capacitors can be changed to vary the oscillator frequency. "To mount the coils, take the film can cap, and screw it to a piece of wood, the chassis, or whatever. The coil will now just "clip" in place. I've gotten to where I find winding coils to be very fun, and the home made type can easily sub for the hard-to-find coils shown on lots of the old plans." I didn't find winding these film can coils to be so fun (it takes me about 30 min. per coil), but the cost is negligible. Rather than use epoxy I secure the ends by looping them through holes pierced in the can. It was mentioned on the list that the 33/66 center tap was not the norm for a Hartley oscillator, but however inscrutable the design choice the coils work well; the circuit oscillates like crazy, even when I sub cheap 12AX7 or 12AT7 tubes for the 12AU7s and drop the B+ voltage down to 90V or so. I later found Michael Rogers's comprehensive site, detailing the construction of his complete Forbes theremin. According to the information presented therein the coil is indeed Antique Electronic Supply part no. 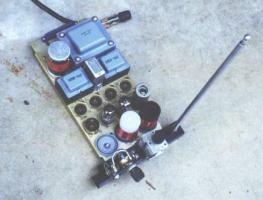 P-C70-OSC, a 455KHz air-core IF transformer, similar to Miller part no. 70-OSC. Only the center-tapped side of the transformer is used for the theremin, with an inductance of 114-240uH between the outer terminals. Please see Mr. Rogers's site for more information than you can shake a stick at. For the chassis I reused a tube-based differential servo motor driver from an old analog X-Y plotter, with the driver circuitry removed and the power supply left intact. Only the pitch section of the Theremin was completed. The circuit could be made to work but tuning was extremely difficult, presumably due to the many sensitive parts being in close proximity. There was also a strange beat frequency superimposed on the basic theremin function, which I suspect was the result of 60Hz line frequency leaking from the aged power supply. Despite these difficulties the instrument could be "played", and served to arouse the ire of my housemate at the time, so I consider it a heavily qualified success. Version 2 is in the works, with little progress made as of yet. My intent is to start from scratch, building each section of the circuit as a physically separate module. The modules will then be tested individually and as a whole in different physical configurations. It is hoped that this flexible arrangement will allow me to find the best layout to minimize interference. 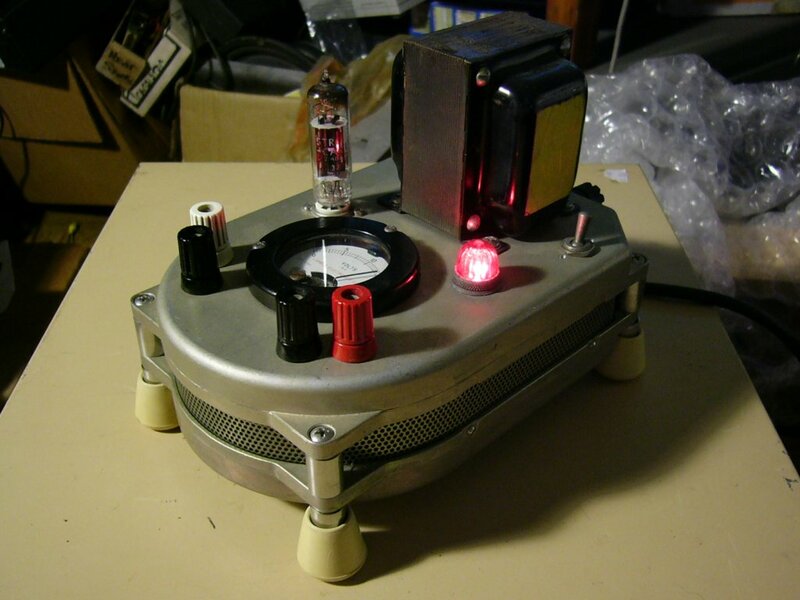 To this end I have constructed a bench tube power supply, which is shown below. The power supply provides 300VDC and 6.3VAC. The 18V panel meter on top has been modified and can be multiplied by 20 to monitor the plate voltage. The 12AU7 tubes used in the theremin have a center-tapped 12.6V filament, which can run on 6.3V at twice the current. The case is made from the top halves of two classic Seagate ST-225 hard drives, incorporating the bottom grill from a Wang serial terminal and panel components from a Lambda power supply. In sympathy with other sentimental fools, I should mention that none of this once-excellent equipment worked. May all such noble technological detritus find new life.